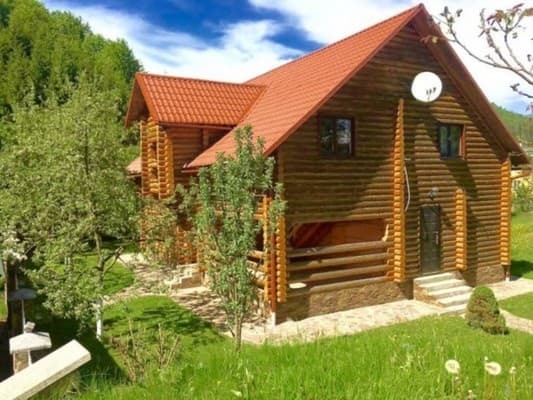 Private estate "Sinyogirska" is located in the village of Staraya Guta. 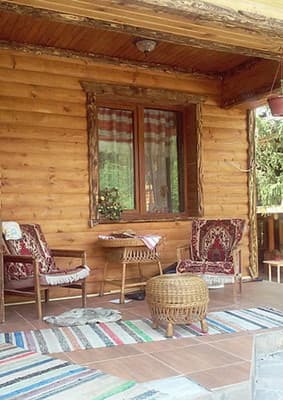 To services of tourists it is offered accommodation in two-storey wooden cottages. Cottage number 1 can accommodate 10-12 people. 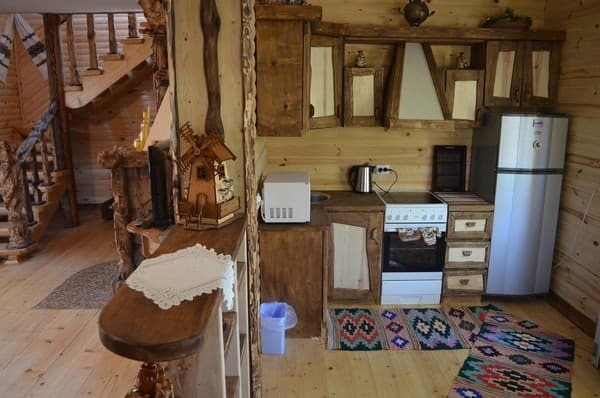 On the first floor of the cottage there is a kitchen equipped with everything necessary for cooking (refrigerator, microwave, stove, dining table, tableware and appliances). Also on the first floor there is a large cozy lounge with a fireplace and a bathroom. 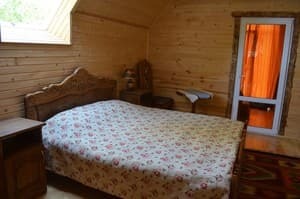 Description of the room: The cottage number 2 can accommodate 10 people. On the first floor of the cottage there is a kitchen with all necessary appliances and cutlery, a hall, a bedroom and a bathroom. On the second floor there are two bedrooms, an exit to the terrace, a lounge with a comfortable sofa bed, a bathroom. 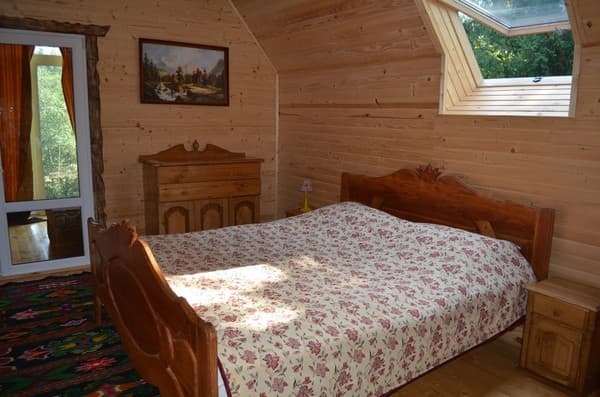 Description of the room: Cottage number 1 can accommodate 10-12 people. On the first floor of the cottage there is a kitchen equipped with everything necessary for cooking (refrigerator, microwave, stove, dining table, tableware and appliances). Also on the first floor there is a large cozy lounge with a fireplace and a bathroom. 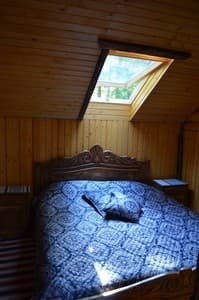 On the second floor of the cottage there are comfortable bedrooms (each with access to the terrace), a hall and a bathroom. The residents have an equipped kitchen for self-catering. 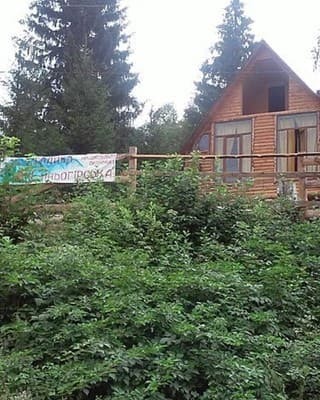 To the nearest cafe and shop 500 m.
Ivano-Frankivsk region, Bogorodchany district, Stara Guta village. The distance to the town of Borodchany is 46 km, the city of Ivano-Frankivsk is 60 km. You can get to Old Guta by regular shuttle buses from Ivana-Frankivsk bus station # 3.